London Transport (LT), and its predecessor London General, had long considered the idea of specially-designed double-deck coaches for the Green Line express services. In 1931, an experimental 6-wheeled AEC Renown LT-type double-decker went into trial service but did not prove popular. 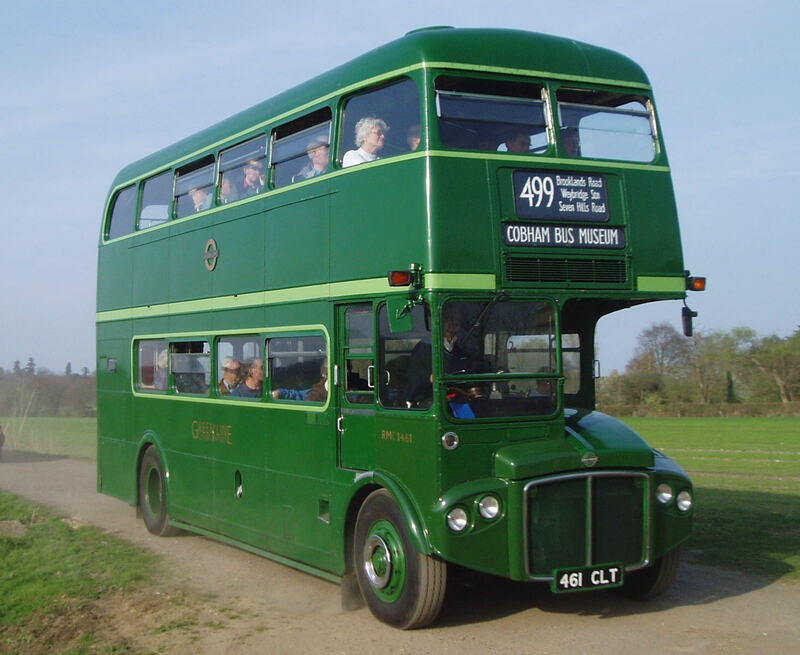 During and just after WW2, standard double-decker buses in Green Line colours had worked on the more heavily-used services but these offered no special features over and above normal buses. After WW2, LT converted one of the first RT-types into a proper Green Line coach with more luxurious trim and, although the coach was mechanically unreliable, much was learnt from its special features and some of this was used in the development work for the Routemaster. Meantime, standard RT-type buses in Green Line colours, but with no special features, worked successfully on some Green Line routes in the 1950s/60s. When LT came to build four Routemaster prototypes between 1954 and 1957, one of these was constructed as a Green Line Coach. CRL4, later re-classified RMC4, proved both popular and successful in service. As a result of this success, LT took the plunge and ordered a batch of 68 RMC Routemaster coaches for delivery in 1962 to replace single-deckers. The RMC coaches were standard Routemasters with considerable enhancements: they had deeply-upholstered seats wth wider spacing, fluorescent lighting, electrically-operated platform doors, luggage-racks, air-suspension and a different gear ratio to permit higher speeds. The coaches were finished in standard Green Line colours of Lincoln Green with pale green relief with a raised ‘Green Line’ bullseye logo on the upper side panels. They were fitted with twin headlights as was the fashion for many private cars at the time. The RMCs were successful in service, to the extent that a further 43 coaches, of the longer RCL-type, were delivered in 1965, but they came perhaps too late. Patronage of the Green Line services was declining fast in the 1960s as a result of the growth of private-car ownership and the introduction of better train services into London. 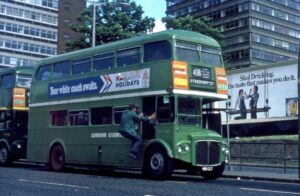 Converting the Green Line services to double-deckers had meant a reduction of the frequency, eg from half-hourly to hourly, which did not encourage their use and the coaches required a two-person crew – driver and conductor – which became increasingly uneconomic. From the late 1960s onwards, many Green Line routes reverted to single-deck operation and the Routemaster coaches were downgraded to country buses. This process continued under London Country after 1970 with the last RMCs removed from Green Line work during 1972. 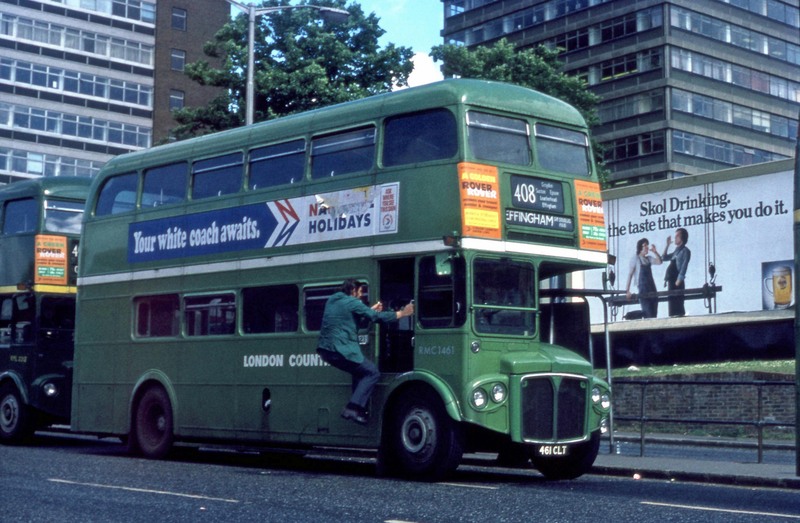 They continued in use as green, country buses until withdrawal between 1977-1980 with a large number subsequently being re-purchased by London Transport for use as driver-trainers. In 1989, six of the RMC driver-trainers were restored to bus service in London. Finished in standard red with gold relief, they operated the X15 ‘Beckton Express’ linking Docklands with central London. The last of these red RMCs were withdrawn from central London service in 2003 but a small number survive as private-hire buses in the heritage fleets of some of the London bus companies. Our coach, originally bearing the fleetnumber RMC1453, was the first of the batch and was used in June 1962 for publicity pictures, appearing on a number of colour posters to publicise these prestigious new vehicles. 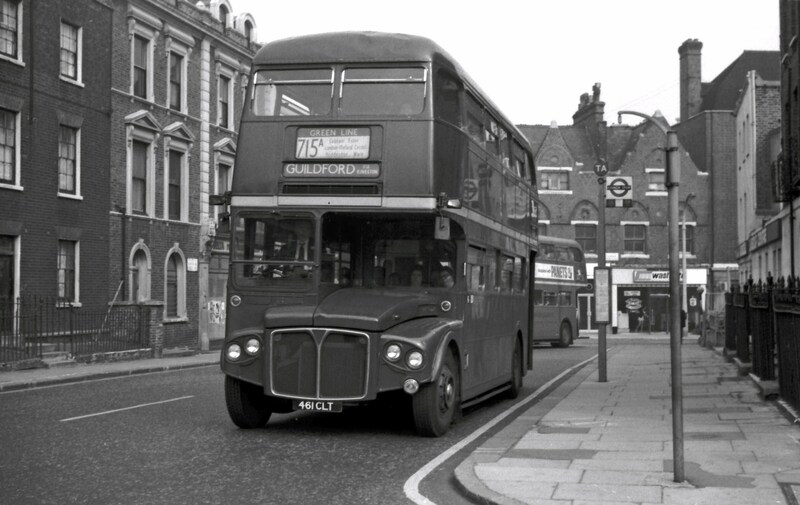 It entered service at Hertford garage in August 1962, replacing RF-type single-deckers on Green Line routes 715/715A. After the round of overhauls in 1967, it was re-numbered RMC1461 and returned to Hertford garage for further Green Line use until its downgrade to a bus in 1972 after which it operated from the country garages in Grays, Leatherhead and Chelsham. In 1970, RMC1461 had passed, along with the whole Country Bus & Green Line fleet, to the newly-formed London Country Bus Services (LCBS). Upon final withdrawal by LCBS, it was bought back by London Transport in 1979, initially for driver-training duties, but by 1989 it had been refurbished as one of the red buses for use on the X15 commuter express from the East End into central London. The bus passed to Stagecoach East London upon privatisation in 1994 and was restored to its original Green Line condition by the staff at Upton Park garage. It continued to be used on various routes in east London until 2003 when it was finally withdrawn and kindly donated by Stagecoach to the Museum. RMC1461 is fully restored and appears regularly in service for the Museum.